My friends, many thanks as always for the generosity of your prayers and for the support that has been offered to help with this ministry as we take the gospel of our Lord Jesus Christ to the streets. My family and I are beyond grateful for what we have seen the Lord do through people. I rejoice to be able to share updates with you as to the fruit of what your prayers and support bring forth. 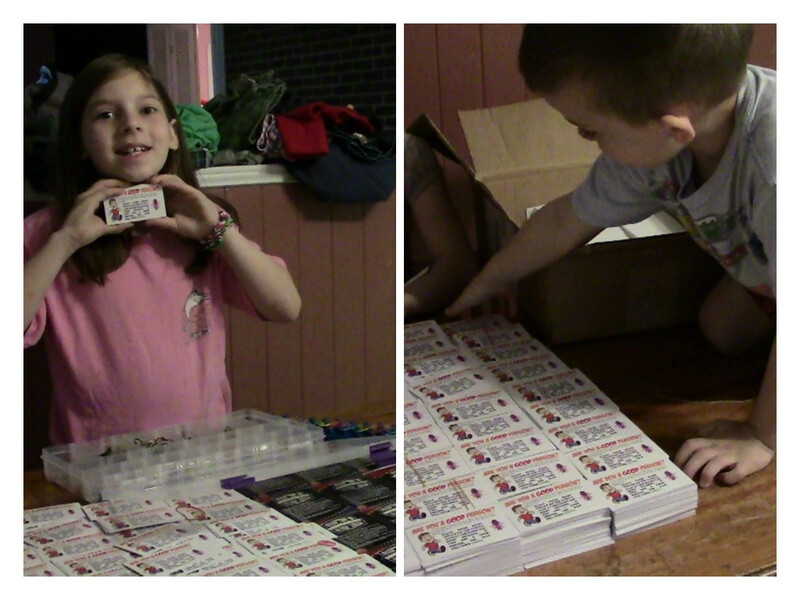 In 2014, we are thankful that over 20,000 gospel tracts went out into the hands of sinners! That the Lord allowed us to speak of His wonders and grace to thousands at many of the college & high school football games that took place here in town as well as in Auburn & Alabama. Our local baseball team, the Montgomery Biscuits offered many opportunities through the months of March – September that have become one of our greatest mission fields during the season. Just recently I ran into a fellow brother in Christ who works with the firm who planned and built the entertainment district downtown. I rejoiced telling him how all that was been accomplished by him and his firm was an answer to my prayers. How for so long I have prayed for an opportunity to witness, then the Lord through men, builds me a giant baseball stadium and turns the area into a place where people gather and can hear the gospel. Amen! Jeff & Cody from Strong Tower Church at AUM earlier this year with me. We began joyfully witnessing at the local university as well. We were met with some scrutiny by local groups who feared that the public proclamation of the gospel or open air preaching would be to offensive. We continued to go out and many have heard the gospel and have approached us desiring to know more and offered great encouragement to continue. 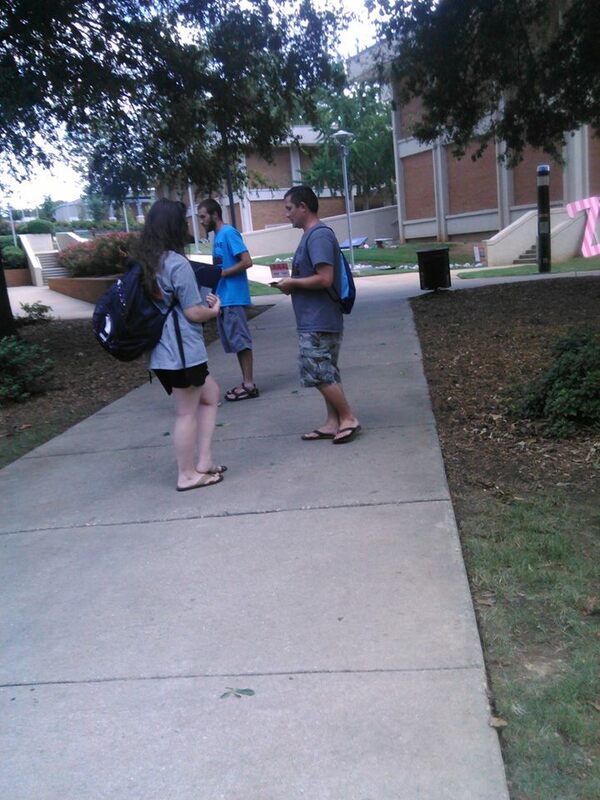 The atheist on campus even encouraged us toward our use of free speech! Much of our time though as been and remains out in front of the local abortion clinic. Many moms and dads continue to find no hope except what seems right to them. Over 100 children lost their lives in the past two months to this evil that is so prevalent in today’s culture. I have joy that even though many did not choose life, seven people that we know of have decided to choose life let their baby live. Our prayers is that they would not only choose life for their baby, but come to know Christ and truly know what it is to live themselves. We ended the year just as we had begin it. 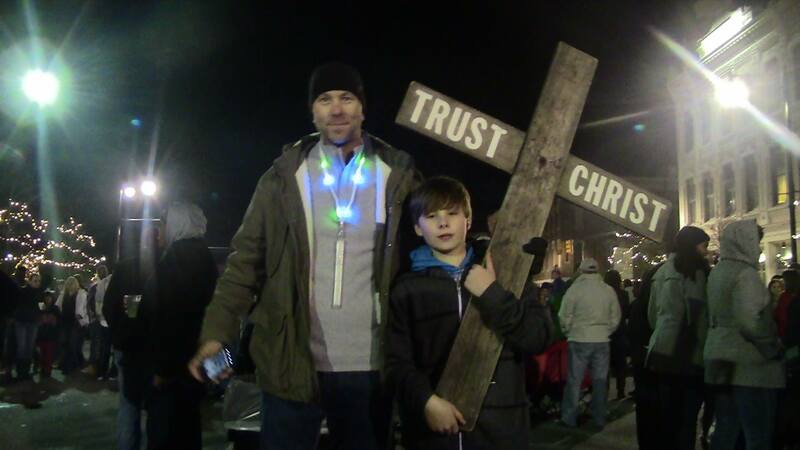 Proclaiming Christ in downtown Montgomery at the New Years Eve celebration. A brother from my church came out and witnessed with me for the first time and them I was joined by a father and his young son who walked by and wanted to help. 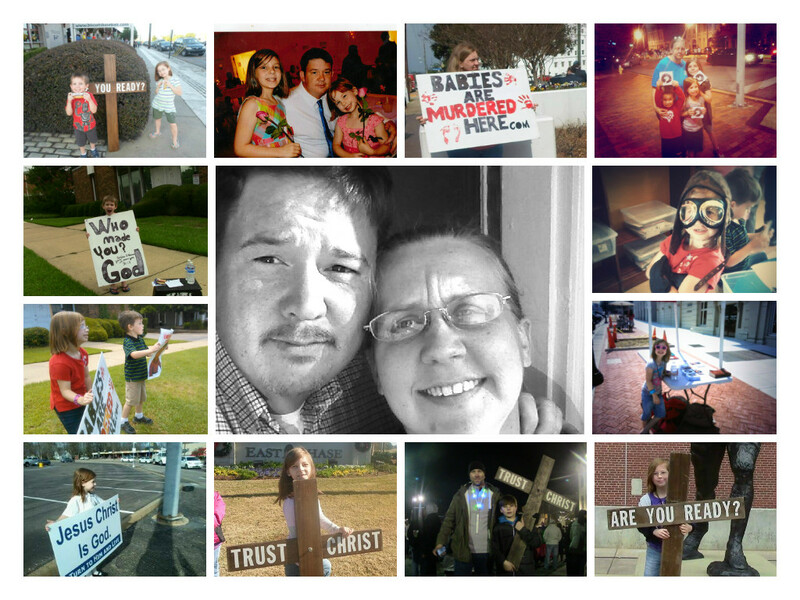 His son passed out tracts and talked with people and each of them praiseworthy held our cross high for all to see. The local news later said that over 20,000 people were downtown that night and some called me the next day telling me that they had seen the cross on TV with the words to “Trust Christ” written on it. Amen & Amen! May God for all that He does get all the glory! I pray that you are encouraged and will this year strive to make God known in your own world by sharing the gospel with others. Whether it be at your workplace, school, or wherever the Lord leads you. He is a KING and worthy to be made much of! May you consider as well this ministry in your giving. We continue to raise support that allows us by His grace to continue. We remain only at about 20% of our fully funded goal each month. The Lord has kept and sustained us, remaining faithful to if He has called you to something, He will prepare and provide the means to do so. Please pray and consider becoming a monthly partner to help take the gospel to lost sinners? Your support will allow for people to get a bible at our Prayer Station and learn to grow into the likeness of Christ through the reading of His word. 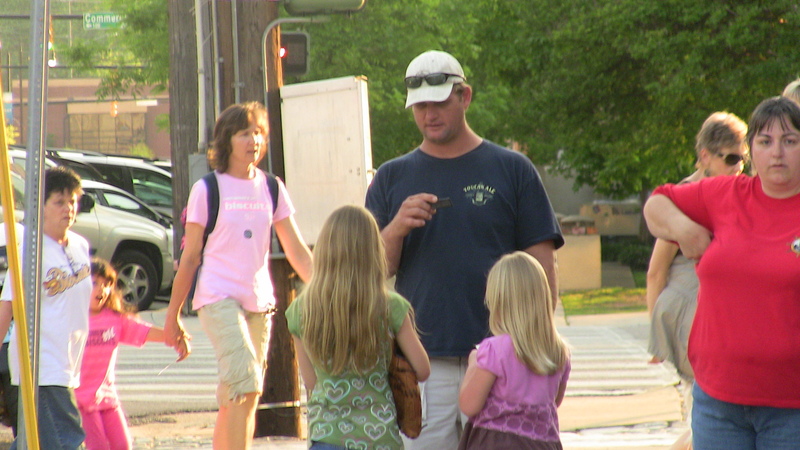 Or for young parents to hear the gospel and get valuable resources to help them choose life outside the clinic. It will allow as many people the Lord places in front of us to hear what is often taken for granted. It will let them hear that Jesus is Lord and He saves even the most wicked of sinners! My family and I are truly thankful for your prayers and support and long to be able to share even more stories as to what the Lord does to draw men unto Himself. 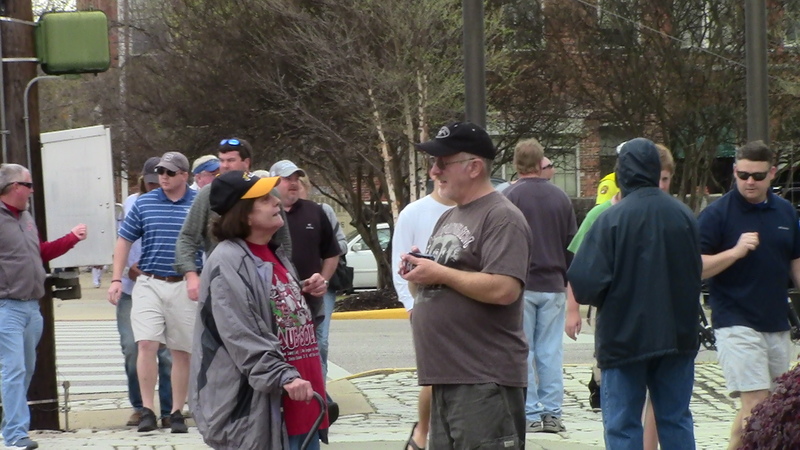 Baseball season is back in swing and so are many opportunities to share Christ with others at Riverwalk Stadium. So far for the month of April over 2,000 tracts have been distributed, an unknown number of conversations with people, and wonderful opportunities to read and preach His word have taken place there. Consider joining us on one of the dates for the month of May. Below are the dates for May 2014 that we are preparing to evangelize at the stadium. The times for the outreaches usually begin between 1 1/2 hours before the first pitch and last 30 minutes after the first pitch. Indeed, the times may change for weekend games as more people flow in and out the stadium giving more opportunities for gospel conversation. 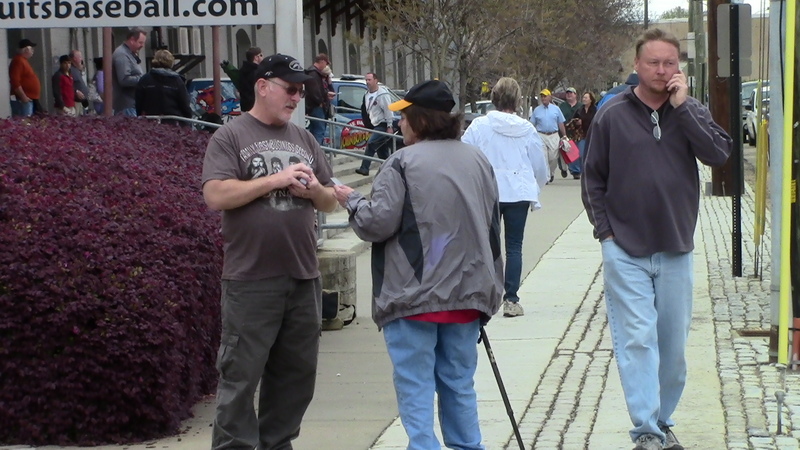 Outreaches consist of engaging people in gospel conversations, distributing gospel tracts ( We have some of you do not), and public reading / proclamation of His word through open air preaching. If you have any questions, feel free to contact me. I have mentioned this before, but recently something occurred that has grieved me and this is a reminder of that incident. Some time ago, a witnessing brother of mine invited his small group from church to join us at the local theater to practice sharing their faith. He invited them a number of times and some said they would come, but none ever showed up. One evening, my friend invited them to a see “The Kingdom” a rated R movie that was playing one Friday night. That evening, six of those in his small group showed up. Where is the passion for God gone? Where is our desire to see men saved. Does it take great skill to tell others how to be saved, how to escape the fires of hell? Not at all, all it takes is the spirit of God and a desire to see men saved. Is that why so few don’t share their faith? Because they lack the spirit of God and have no desire to see men saved? Why do men prefer movies or ball games over pleading for the souls of others? Is this the Christ we have come to serve? Not the one who set the standard when it comes to seeking the lost, who laid down His own life even while we hate Him, but a Christ who is more concerned with feeding the flock, ball games, and pot lucks? Let me finish, I have no problem with fellowship, or going to the movies or pot lucks and ball games. I find that fellowship with others in Christ is a blessing and very encouraging. But there must indeed be a proper balance. And indeed as well, the act of sharing the gospel was not a request for a certain few who professed Christ, it was a command for all who Christ has redeemed. A few months ago, I was contacted by some brothers in Christ about participating in a nationwide Major League Baseball outreach sponsored by Bezeugen Ministries, One Million Tracts and Sports Fan Outreach International. 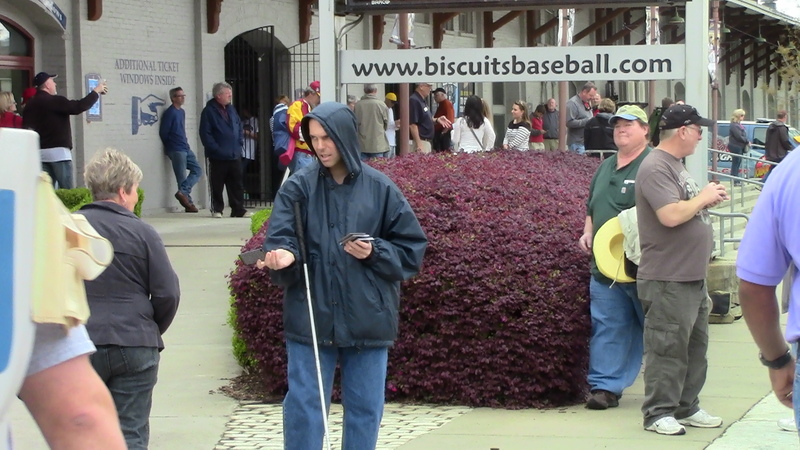 Of course the Biscuits are a Minor League team, but it was still an opportunity to gather other seed-sowers and take the gospel to the streets. On March 15 of this year, we had our first outreach with the Max Capital City Classic at Riverwalk Stadium between the college teams of Auburn University and the University of Alabama. The night as always brought many opportunities to speak to people about eternity and preach the Law & the gospel. I was joined by by brother in Christ Rafael Ray for this outreach who brought much encouragement to the table as he engaged some in discussion that did not agree with our preaching as well as witnessing with many others. As always, I am very thankful for his desire to reach the lost and glorify God. 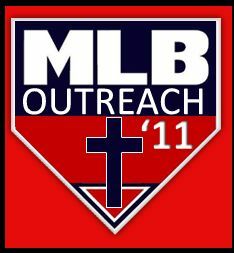 The next MLB outreach took place this past Saturday evening, April 9, 2011. Again, what a joy the night offered as the gospel was proclaimed to the fans outside the stadium and the downtown area. We began these two outreaches with 2,500 tracts and gave away all but a few hundred. The laborers were short for these outreaches, but by no means was the opportunity to witness hindered. It brings us joy knowing that God is the author of salvation and we can only rely on him to save people, not on how many tracts we have and how many people we have to pass the out. He alone is sovereign. Once again, only God knows those who responded to the the call of repentance and faith in Christ alone through the obedience of His people who have participated in the sharing of His gospel across this country. I think it will be a great encouragement to many professing believers in Christ to be bold and to begin to share their faith as well with all they know. For us the MLB outreach is over. However the Biscuits season is just starting off. We have many more home games that offer great opportunities to PRACTICE sharing your faith with others in this city. Please keep us in prayer as we go as commanded. Please consider joining us as well for laborers are few and all hands are needed. You can click here to follow us on Facebook and see more pictures. 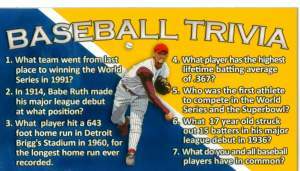 What is the number one question most likely won’t be asked at a ball game? 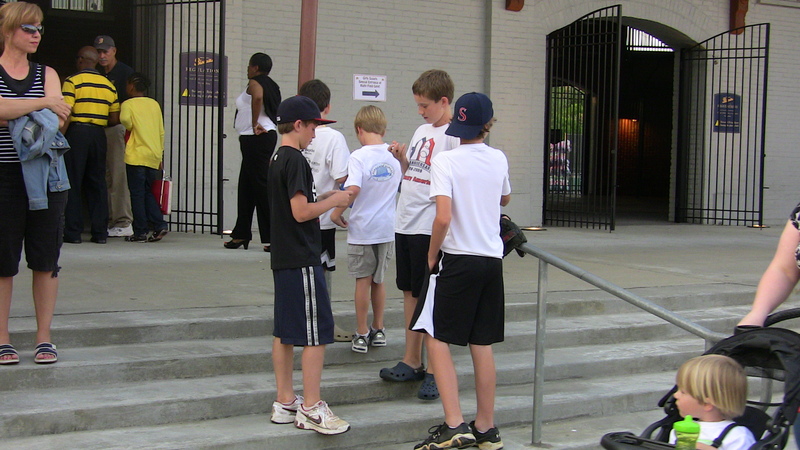 It is estimated that each year, over 75 million people attend baseball games. From April to Early November, family and friends and others flock to the ball parks for a good time, a hot dog and of course some peanuts and Cracker Jacks. They sit back for nine innings rooting for their home team, waiting for that home run or foul ball to come their way with hopes of catching that souvenir. Of these 75 million people what is the one question that they be asked that night? Tickets please? What time will this game end? More peanuts, whose on first maybe? Of the countless questions one may be poised to asked, what is the number one question one might not expect to get asked? The one question that most baseball fans would not expect to be asked is, “If you died tonight, where would you spend eternity? For many, that question is as far from your mind as center field is from home plate. 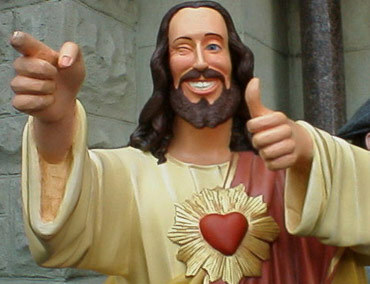 You come to a ball game and the last thing you expect is to be asked is whether you will go to heaven or hell. But of all the questions you will be asked in your life time, the question of eternal salvation is the most important. 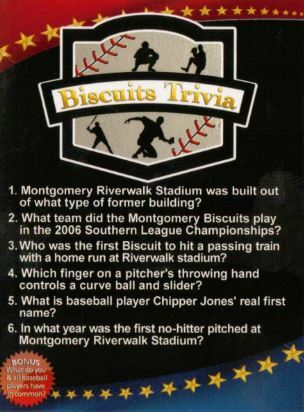 On March 15, the city of Montgomery will host the Capital City Classic at Riverwalk Stadium. ( click link for directions ) This is the rivalry game between the University of Alabama & Auburn University. This is event is expected to draw well over 5,000 people and gives us a great opportunity to practice sharing the gospel with others. Please consider joining us this coming Tuesday night for a night of sharing the most important message with all we can. The gates open at 5:30PM, but it is suggested you come at least 30 to 45 minutes early to speak to those waiting to get in the stadium. One rule we have is that in the past we have been asked to stay off the stairs in front of the stadium when witnessing and on the sidewalk. Tracts will be provided.